If you are looking for an executive service for business or pleasure, Turners Executive Fleet can provide the highest level of comfort. From shopping trips to group travel for a sporting event, festivals or a day out, Turners provide coach services to get you there and back again. Our Airport transfer service is reliable and straight forward making the process that little bit easier. With a history of getting children to school on time, Turners focus is on safety and security and is considered the highest of priorities. At Turners Coachways we understand the importance of arriving at your destination as refreshed as when your journey started. We want you to have an enjoyable travel experience and we pride ourselves on offering all our passengers a quality and stress free service. 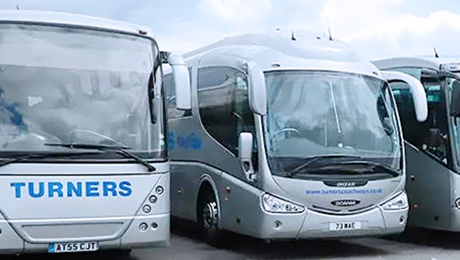 With a service dating back to the 1960’s, Turners Coachways have never let a customer down. Our coaches are as reliable as our word. Our executive fleet provides the highest levels of comfort and a professional, reliable service for business or pleasure. From shopping trips to sporting events, festivals or a day out we can provide Private Hire services to get you there and back again. Our flexible Airport Transfer Service is reliable, stress free and straight forward, making the process that little bit easier! Turners provide a number of schools with dedicated coach services to and from school along with day trips and excursions. Turners have a number of second hand but fully serviced and well maintained coaches and mini buses for sale at excellent prices. Turners provide a number of schools with dedicated coach services to and from school along with trips and excursions.